Codeine or methylmorphine is an opiate used for its analgesic properties. It is also used to treat coughing and diarrhea. It is marketed as the salts codeine sulfate and codeine phosphate. Codeine hydrochloride is more commonly marketed in continental Europe and other regions. Codeine is an alkaloid found in opium in concentrations ranging from 0.3 to 3.0 percent. Codeine can be extracted from opium. 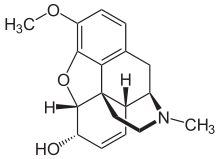 Today, most codeine is synthesized from morphine through the process of O-methylation. Cough, though its efficacy in low dose over the counter formulations has been disputed. Codeine is often marketed as drugs in combination with paracetamol (acetaminophen) as co-codamol (best known in North America as Tylenol 3). Research has shown the combination to be very much more effective than paracetamol, and much less addictive that pure codeine. There are similar combinations with aspirin as co-codaprin or with ibuprofen. These combinations provide greater pain relief than either agent alone. Drug synergy is an important principle. ↑ Schroeder K, Fahey T (2001). "Over-the-counter medications for acute cough in children and adults in ambulatory settings.". Cochrane Database Syst Rev: CD001831. doi:10.1002/14651858.CD001831. PMID 15495019. This page was last changed on 1 April 2013, at 09:27.